Profits from the Green Revolution * Green Investing Strategies * Our four cornerstones: Oil, Coal, Efficiency, Materials * "War on Oil"
Vinod Khosla. We spoke at the AlwaysOn Stanford Innovation Summit in 2006. As you now know, thousands of millionaires  and quite a few billionaires - were created in the 1980s and 1990s due to advances in computer technology on a scale never seen before in history. This massive wealth was created as new products and services were developed by startup companies nobody had ever heard of at the time  companies like Microsoft and Apple Computer in the PC area, or Cisco Systems in the router and server area as the enormous buildout of the Internet took place. And this eventual massive wealth would not have been possible without funding from Silicon Valley venture capitalists  or VCs for short  that provided the startup capital for these now very familiar companies. Well, it seems history is repeating itself. In fact, for the first time ever  a widespread consortium of players, including environmentalists, the offending industries, academia, state and federal government regulators, and  most importantly  the VC financiers, are promising not only the rapid development of new technology, but also the money to make it a viable and profitable business. The Next Big Thing could create this decades new millionaires and billionaires. And that Next Big Thing is really The Big Thing and its Alternative Energy. Hi, my name is Ian Wyatt, Chief Investment Strategist at Rising Star Stocks. 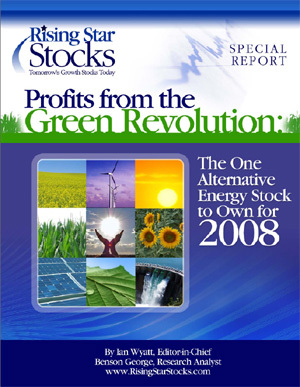 Im very excited to release my stock research report Profits from the Green Revolution: The One Alternative Energy Stock to Own for 2008. Alternative energy investing continues to be hot as investors cant seem to get enough from companies in this space. My report from 2007 pointed out some real winners in this space, including Zoltek Companies (Nasdaq: ZOLT) up +92% in the first six months after initial coverage and DayStar Technologies (Nasdaq: DSTI), up an amazing +142% in 5 ½ months since the report was released. 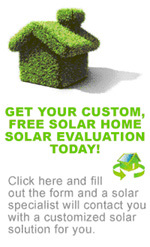 With continuing increased demand for sustainable green energy options, I've got a company for you that presents a profit opportunity with the potential to exceed last years winners. That company is Amtech Systems.